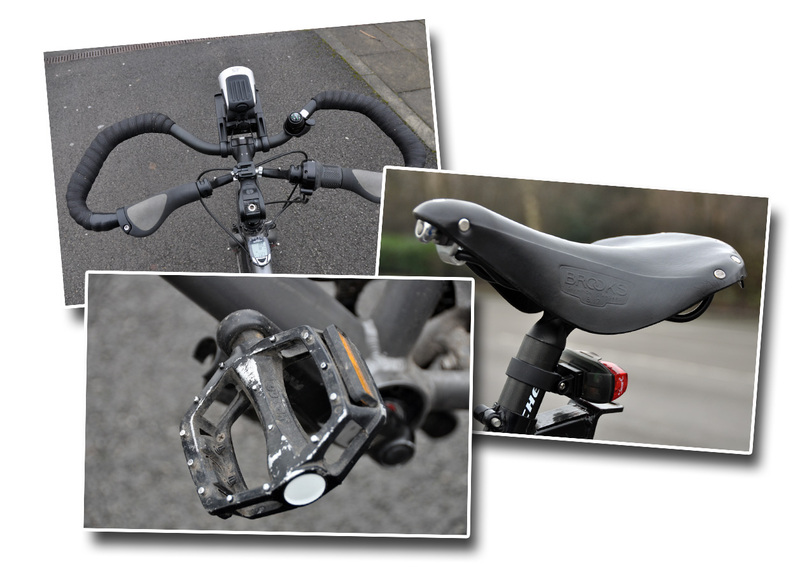 The Brooks B-17 saddle is difficult to review. We can’t say that we love it, but we both agree that we wouldn’t use anything different, especially now that we have gone to the effort of wearing ours in. We chose the Brooks B-17 as it had good reviews from the cycle touring community and also it came as standard with our Thorn Nomads. Paddy went with the black version, whilst Laura opted for tan as we were told it would soften up quicker. We’re not so sure that it true, but the tan does develop a lovely worn-in colour. Laura chose not to bother with the specific female version as it added to the cost. A wise move or not? We aren’t sure. Laura has definitely suffered most with discomfort, but there is no guarantee that the women’s version would have been better. Probably though, if given the choice again we would have spent a few extra pounds. The saddle lived up to its reputation regarding the infamous bedding-in period. On our three day ride home after buying the bikes, we had to take a train for half of the second day because Laura couldn’t sit on the seat. Cries of ‘childbirth can’t hurt this much’ were uttered. She started the trip around South America wearing two pairs of padded shorts, loaded with chamoix cream and popping ibuprofen when it got too bad. Early on, we also used a lot of proofide on the saddles, but as much as this comes recommended we think it’s really down to sitting time. It’s hard to say when the saddles became more comfortable because we still have moments when they hurt, but by the time the tub of chamoix cream had run out Laura was down to one pair of shorts and had stopped with the pills. Paddy’s had much less discomfort from his saddle and a big part of this, we think, is seat position. Laura’s bike needs some readjustments and we think with a better riding position she will find the saddle more comfortable. We have been able to tilt the saddle and move it around to find the best spot, which is good. We find that when we ride in one position for most of the day we tend to experience more pain. Riding on the flat puts a lot of continual pressure on the bottom, whilst riding in the mountains in Peru we both suffered badly with chaffing. Laura has since abandoned her padded shorts, as she discovered the areas where the saddle was rubbing was on the edges of the pad. She finds cycling in normal lycra shorts much comfier and we have heard the same from other female cyclists. The Brooks, being leather, does need some looking after. We were good with proofiding the saddle in the beginning, but probably should be more diligent to keep the leather protected, especially as it does get scuffed easily, for example when turning the bike upside down for maintenance. Recently the large bolt underneath Laura’s saddle fell out. This is there so you can tension the saddle. When breaking it in it is recommended to loosen the bolt for a more comfortable ride. The thing that we hadn’t done was to tighten it up as the leather had worn in. Consequently the bolt had fallen out. It’s hard to imagine how it is able to slip out, as it is a nightmare of a job to get the bolt back in. We spoke to Brooks’ friendly maintenance team, who said the best thing to do was to send it back to them as they have a special machine in the factory. As that wasn’t an option they recommended taking it to a bike mechanic. In the end we spent a couple of hours banging and squeezing the bolt back into place. The technique that worked for us was for one person to stretch the leather on the saddle as flat as possible whilst it was upside down on the floor. At the same time another person pushed the bolt down until the lip of the bolt was caught on the metal ring. Next we hammered the bolt down with the handle of our penknife until it finally slotted into place. Not what Brooks recommends, but a solution when out on the road! In the hills of Peru, Laura temporarily tried a gel saddle to see if that would be any better. It wasn’t, and since then we have both come to the conclusion that we’ll be sticking with the Brooks. Sure it makes you put some effort into wearing it in and look after it, but after time, with adjustments and working out the best clothes for you it is a great cycle touring saddle. Style – the Brooks B-17 looks good and, instantly, you stand out as an official cycle tourist! Good news that you’ve decided to stick with the Brooks. I’ve done between 300 to 400km’s on mine so far and it’s starting to feel good. A bit like putting on a worn in pair of boots. I’ve had the advantage of using it on short rides of between 30 and 50kms. Longest being in the region of 70km’s. so I haven’t had any pain. Maybe that’s the secret! Thanks for the review! I spent a month breaking my Brooks in just commuting in town. Even those short trips left me saddle-sore. I can’t imagine breaking in my Brooks during a tour! Kudos to you for sticking with it. My B17 has supported me during 6000 miles of touring and commuting over two years now. Got to be honest about it. I have proofided once and tightened it once. It has been comfortable from first use and still looks great despite being out in all weathers. I bought a ladies specific imperial , like the B17 with a cutout. I did a 30mile ride with a little trouble and that has been it- broken in. I’ve tries all kinds of saddles and have had some really bad blisters from rubbing over the years- no more problem since the Brookes was bought. MY DH thought I was mad to go to the expense as I’m 60+ but it’s the best money spent. I can ride fully loaded 50+ miles a day with no problems. If any lady is looking to buy a saddle then go for a Brookes you won’t be disappointed. I can’t argue with your experience but I have to say I’m surprised that you had such discomfort with the Brooks B17. My first one went on my Thorn Sterling and straight into two weeks on the road. All day riding. At the end of each day I was amazed to feel like I’d just been for a short ten minute ride. That is to say ,no discomfort whatsoever. So I thought the stories of that long infamous break in period were exactly that..just stories. A myth. Your experience seems to be different. I now have B17’s on three of my bikes. None of them are uncomfortable and I only wear regular clothes ( no padded shorts or chamois). I have found that the angle of the saddle can make quite a difference. It’s essential to get it right. If you feel any pain or discomfort on a Brooks try angling it down a little or adjust the forward/ back position of the clamp on your rails. The saddle itself should conform to your contours, new or not. That’s the whole idea of the leather. Saddles are not comparable to new boots that you put your feet IN. You sit ON a saddle. It’s a poor comparison. I don’t believe that the new leather on a Brooks saddle really needs much breaking in or that the saddle shape itself is uncomfortable it’s just a question of adjustment.Also remember the bike saddle isn’t a sofa. Move your position regularly and slide around on it. A Brooks treated with proofide makes this easy. Hope you are getting more comfy on it now. My worst ever was the SDG one that came on my mountain bike. I thought it was going to kill me!